Cleopatra IGT Video Slot Guide & Review - Casino Answers! 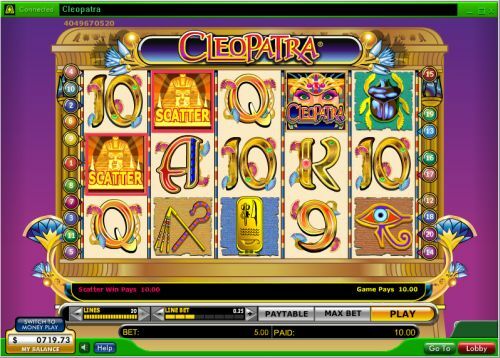 Cleopatra is a 5-reel, 20-line video slot developed by IGT and found at Random Logic casinos, featuring a wild symbol, scatter wins, multipliers and a free spins feature. You can play the Cleopatra video slot at Bovada. Bets on the Cleopatra slot machine are $0.05, $0.10, $0.25, $0.50, $1, $2, $5 and $10 per line. You can select from 1-20 paylines. You can bet as little as a nickel per spin on the Cleopatra video slot up to a maximum of $200 per spin. Cleopatra has a large betting range, suitable for casual players in addition to high rollers. To play the Cleopatra slot game, press the “Play” button. To play with all 20 lines selected, you can also use the “Max Bet” button to spin the reels. The highest paying symbol on the Cleopatra online slot machine is the Cleopatra symbol. 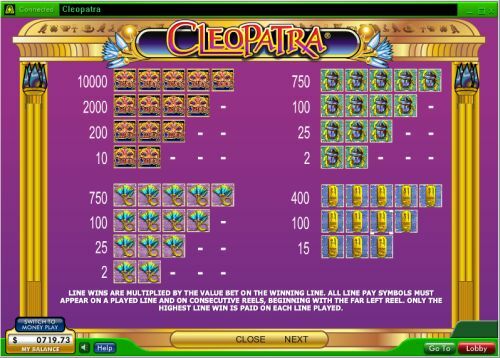 If you hit 5 Cleopatra symbols on a payline, you will win the 10,000 coin top jackpot. The Cleopatra symbol is a wild symbol. It will substitute for all other symbols in the slot game except for the scatter symbol and doubles your winnings. Cleopatra’s scatter symbol is the Sphinx symbol. You can win up to 100X your total bet if you hit 5 Scattered Sphinx symbols anywhere on the reels of the Cleopatra video slot. 3 or more Scattered Sphinx will win you 15 free spins with a 3X multiplier. The only win that is not tripled is the top jackpot. Additional free spins can be initiated during the free spins feature. Additional free spins are added to the free spins. The free spins feature will end once you run out of free spins or you have played the maximum 180 free spins. You can win lots of cash from the free spins feature on Cleopatra when you play at Bovada. Cleopatra has a very good top payout as well as the chance to win a lot from the free spins feature. You can play the Cleopatra video slot when you sign up and make a deposit at Bovada. Can players from the United States of America play the Cleopatra online slot for real money? American players cannot play the Cleopatra video slot for real money at Random Logic casinos. However, American players have a great selection of alternatives when it comes to Cleopatra slots, including the Cleopatra’s Gold Video Slot that you can play at Bovada, the Cleopatra’s Coins Video Slot at Bovada and Cleopatra’s Pyramid at Bovada.